The new NBA season is around the corner and for any given fan that translates into excitement. I have been a big fan since the Jordan vs. Magic days and, although my interest in the league at some point kind of plateaued out, the increasing addition of Spanish players to the league and my living in the US for 5 years re-sparked my passion. It is a fact that in the last years we have enjoyed the best basketball generation in Spain ever and the fact that in season 2016-17 we will have 10 Spanish players in the NBA proves that once again. 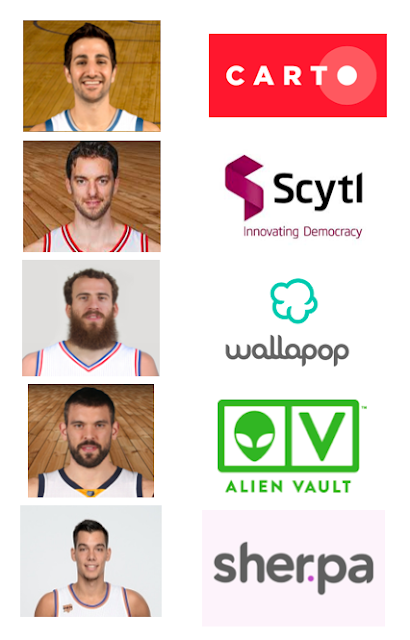 Over the years, an increasing number of Spaniard players has flown across the pond to conquer the Americas - the Gasol brothers being the main case in point - and that is something that we can also increasingly say about Spanish startups. 1. Ricky Rubio - CARTO: Ricky is regarded as a great defender, passer and stealer, he is one of the best PG in the league. His Timberwolves seem to finally have a promising, yet still young, roster. Success may not be far away. If I had to bet on big success for a young Spanish startup, my chips would go for Carto, the Madrid and New York-based company focused on discovering and predicting key insights from location data. I love what they do and the endless possibilities their product and services offer. They have raised $31M so far and have a great team in place. 2. Pau Gasol - SCYTL: Pau is the best example of NBA success for a Spanish player to date. Little needs to be added, except for the fact that after joining the Spurs he should have another shot (GS Warriors permitting) at another ring. Along these lines, Barcelona-based electronic voting company Scytl has been around for some time (it is not a startup anymore I'd say), has an established presence in the US and there are rumors that it may file for an IPO on the Nasdaq in 2017 after having raised more than $100M in venture capital. There is so much young startups can learn from Scytl, same as young players from Pau. 3. Chacho Rodriguez - WALLAPOP: Chacho is about to start his second stint in the NBA at the 76ers after a not very successful time in Portland and a number of subsequent super fruitful seasons at Real Madrid. Philly is a team that continues to be rebuilt since Allen Iverson's departure and that enjoys the support of Philly's very passionate fans. Chacho has now the ability, experience and the minutes to shine. Following its becoming one of the recent darlings of the Spanish VC scene after attracting a huge (yet non-monetized) community of users to its classified ads marketplace, Wallapop has embarked on its US adventure by merging its US operations with Letgo. However, it will be a tough battle with entrenched players such as Craigslist and others. 4. Marc Gasol - ALIENVAULT: Marc has already enjoyed a pretty long career in the U.S. (in fact, since his high school days upon his family relocation when Pau joined Memphis), has critically helped the Grizzlies get to the next level so they compete face-to-face with the best, plus has also been able to make a personal impact in the league as one of the undisputed best centers. AlienVault was founded in 2006 by Spanish entrepreneurs and since then it has become a quasi-US company based out of Silicon Valley and a very relevant player as a platform providing security solutions for compliance and management threats. The company has raised $118M to date and may pride itself of having renowned investors such as Kleiner Perkins. Does it smell like unicorn here? 5. Willy Hernangomez - SHERPA: Willy will be starting his NBA career at my dear Knicks after a far from ideal last season at Real Madrid. A big challenge for him, as the weight of the Knicks jersey and of the Madison Square Garden is widely known. The additions of Rose and Noah, the growth of Porzingis and the steady hand of Phil Jackson will hopefully be a good support for Willy. Although its AI-based personal assistant in Spanish has been in the works for quite some time, Sherpa has finally launched and jumped into the battlefield where it will be facing tough opponents such as Apple's Siri or Microsoft's Cortana. Sherpa has already shown big potential after entering into a partnership with Samsung and the growing Hispanic demographic in the US is out there waiting. 2017 will be a significant milestone for the company. Let's see how the season goes.